Rather than using an Ethernet magnetics component, is it possible / reasonable to simply use individual isolating transformers? Inside the magnetics component, it's clearly made up of individual transformers. Is there some reason that people always seem to get these as a single package, rather than using them discretely? What I'd like to do is to get rid of the large plastic casing, and try to save a little precious space on my stupidly tight PCB. After a lot of searching, I think I have found a suitable transformer: Wideband Transformer with 2 Windings and Tap. 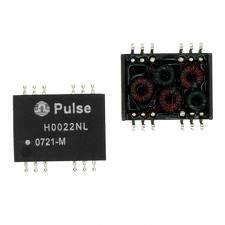 Just discovered that you can buy those from Mouser, and they are very expensive! You don't need to use a integrated transformer package, but these are convenient and small for most designs. They are also at the right impedance and are usually 1:1 but different ratios can be found for different voltage systems on the board side. These transformers often also have baluns integrated on the network side of the two differential pairs. Those aren't necessary according to the ethernet standard, but you may have EMI problems without them. AT the minimum, you have to provide the two pulse transformers with the right frequency and impedance characteristics somehow. You could use a magjack. An ethernet socket with the magnetics included. Not the answer you're looking for? Browse other questions tagged pcb-design transformer ethernet magnetics ethercat or ask your own question. Ethernet: how important is the magnetics topology? 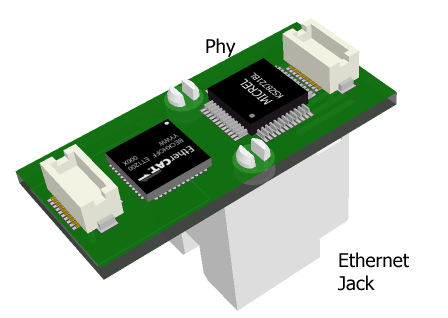 How does Ethernet magnetics work?